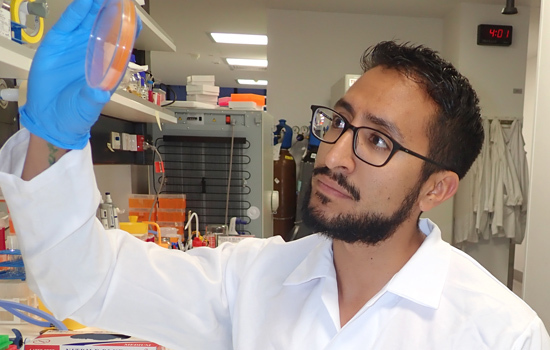 Dr Fernando Gordillo Altamirano, a medical doctor undertaking PhD in science at Monash University has co-authored a compelling case on the benefits of Phage therapy in Clinical Microbiology Reviews, a leading journal in the field of medical microbiology. “As a medical doctor, I believe that few of my colleagues are aware of how much the field of phage therapy has grown over the last few years,” Dr Gordillo Altamirano said. “Phage therapy has the potential to save many lives,” he said. Dr Jeremy Barr, who is supervising Dr Gordillo Altamirano’s PhD, heads the Bacteriophage Biology Research Group at the Monash School of Biological Sciences. He co-authored Phage Therapy in the Postantibiotic Era together with Dr Gordillo Altamirano. “Countless infections are becoming almost impossible to treat with antibiotics,” Dr Barr said. Doctors Gordillo Altamirano and Barr reviewed more than 100 scientific and medical reports on the development and use of phage therapy, both in the laboratory and in clinical trials with actual patients, from all over the world. “Phages have been successfully used to treat all sorts of infections, from dysentery and wound infections to even life-threatening cases of septicaemia – when bacteria enter the bloodstream,” Dr Gordillo Altamirano said. Local Melbourne man, Ian Iaing, travelled to Tbilisi, in Georgia, to undergo phage therapy for the treatment of a long-term prostate infection. The infection had stopped responding to antibiotics, and after consulting with his urologist, Ian decided to pursue phage therapy as an alternative. “I travelled to the Eliava Institute in Georgia, where I underwent two and a half weeks of phage therapy,” Ian said. “When I left Georgia, my infection seemed under control. But after about a week I had a recurrence,” he said. Ian said he would advise anyone looking to undertake the treatment in Georgia to stay there and complete a full four-week treatment, and not return in two weeks as he had done. “I have had contact with several patients and they have all needed to keep at it for a while,” Ian said. Phage therapy was first implemented almost a century ago, but it was brought to a standstill after the successful introduction of antibiotics. “Now, with the rise of antibiotic resistance, phage therapy is experiencing a well-deserved rebirth,” Dr Barr said. According to Dr Barr, Phage therapy is also versatile and can be used in combinations or with antibiotics to maximise the effects of both. “They can even be used to revert superbugs back to their antibiotic-sensitive forms – an approach we are testing here at Monash University,” he said.